Royal Rogue is a stunning black & white pinto gelding and triple registered with Half-Arabian, National Show Horse, Pinto Horse Association, and Lifetime with USDF. We have owned Rogue for almost 8 years and shown him in Dressage, Arabian Main Ring & Sport Horse Shows, Hunter-Jumper, Play Days, Open Shows, and gone to Trail Rides & Clinics. We have many ribbons and photos and memories that will last a lifetime. Rogue is 2012 Adequin's Region 9 winner for Level One for Half-Arab and overall was #6 in the United States for the same year. He is 2 scores away for his USDF Lifetime Performance Award for Level 1. He would be excellent for a Youth or Adult Amateur rider. We hope his next owner and family enjoy him as much as we have! Royal Rogue is a beautiful show and pleasure horse. We have owned him for over 8 years and shown him in Dressage (currently showing Level 1 & training @ Level 2), English Pleasure, Hunter, Sport-Horse, Halter, and Play Days. He has a very competitive nature in the show ring and enjoys the trails as well. His gaits and transitions are all smooth, he collects easily, and he has a very soft and forgiving mouth. He is currently raining with Betty Waldo (Gold, Silver) at Southern Oaks Dressage in Cypress but also trained with Karen Brown (Silver, Bronze) of Blue Fox Farms in Pearland. 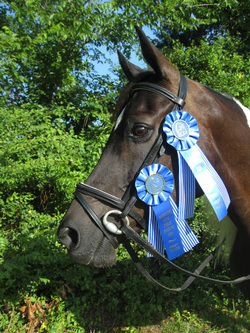 Rogue has been a Regional Qualifier for Half-Arabian Halter, Sport Horse Classes, and has also won in Liberty classes. He is current on all shots & coggins. Rogue has never coliced or been lame. He clips, loads, trailer ties, cross and single ties, farriers easily. Rogue has been a terrific trail horse as well - he can lead or follow. He has also been in a neighborhood Forth of July Parade. He would be an excellent horse for either a Youth or Amateur Adult rider. Feel free to call or email for questions or make an appointment.